Both capitalism and neo-liberalism basically advocate free market economy without state control. The dividing line between capitalism and neo-liberalism is so thin that many consider the two concepts as synonymous with each other. Yet there are differences that give each of them a separate identity. Capitalism advocates free market economy where forces of demand and supply regulates the market without interference of the state. This encourages profit motive and promotes entrepreneurship. It lays emphasis on the rule of law and confines state participation to administration and maintenance of law and order. Owing to stiff competition among entrepreneurs, goods are produced at the lowest possible cost in a capitalist market. However, this entails payment of low wages to workers who are unable to avail goods and services that are not affordable to them. As state has no responsibility to make any services available to its citizens, lowly paid workers may suffer inconvenience particularly where essential services such as healthcare is involved. This is an ethically unjustified situation and a negative feature of capitalist economy. However, capitalism has many variants. According to some models, state should make big investment in infrastructure and take measures to increase employment which is necessary for full growth of capitalism. Some models want a society in which some aspects of social life remains non-capitalist in nature while capitalism plays its part in effecting economic growth. These models do not want the socio-cultural values to be dictated by the drive to accumulate capital – the core spirit of capitalism. Before discussing neo-liberalism, let us focus on its origin – liberalism that prevailed in the USA through the 1800s and early 1900s. It advocated the theory that free trade was the best way for developing a country’s economy. During the Great Depression of the 1930s, it was challenged by John Maynard Keynes, a renowned economist, who advocated full employment for full growth of capitalism and viewed that it could be made possible by area-specific intervention of the Government and central bank for creation of employment. By following the Keynesian theory of the Government working for the common good, the USA had witnessed substantial improvement in standard of living of a sizeable number of people. However, the crisis of capitalism over the past two and a half decades has paved the way of the revival of the previous liberalism with a greater force under the name “neo-liberalism”. 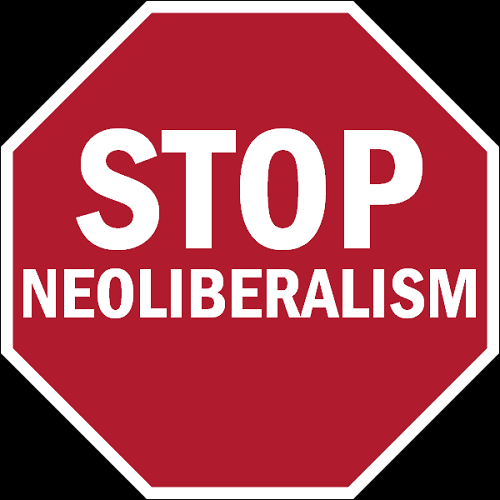 Neo-liberalism is a political philosophy that claims to understand the relation between human nature and economics and concludes that maximization of human flourishing can be achieved by maximization of profit of the capitalists. It denotes a set of economic policies that support economic liberalization, open markets, deregulation, abolition of license and all forms of state control in trade and commerce and rapid globalization of capitalist economy. Neo-liberalism advocates its philosophy irrespective of whether it harms the interests of the workers and breaks the safety-net for the poor. It defends reduction of expenditure on account of social benefits like healthcare, education, public utility services which have an adverse bearing on the interests of the public. Neo-liberalism wants to replace the concept of public good and social security with individual responsibility. Going by this approach, individuals have to help themselves under all circumstances, without looking up to the state for assistance. Many believe that neo-liberalism is being used by the capitalists to recapture its powerful position that it had lost after the Russian revolution and rise of social democracy in Europe. As is clear from the above, capitalism is an economic practice and neo-liberalism is a philosophy that fanatically formulates how societies practising capitalism should be managed. Pinaki Chakraborty. "Difference Between Capitalism And Neo-liberalism." DifferenceBetween.net. January 11, 2016 < http://www.differencebetween.net/miscellaneous/politics/ideology-politics/difference-between-capitalism-and-neo-liberalism/ >. This gives an extremely narrowly and mostly incorrect explanation of capitalism. It is not nearly the same as classic liberalism/neoliberalism. State capitalism or Keynesian economics is vastly different from the laissez-faire approach associated with classic liberalism. Detailing these differences is vital in explaining and understanding the difference between a Social Democratic and Third Way ideology.